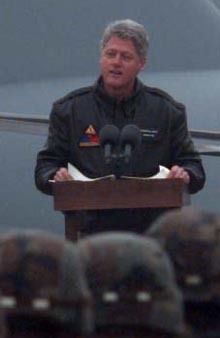 US President Bill Clinton speaks to U.S. service men and women deployed to Tuzla Air Base, Bosnia and Herzegovina, on Jan. 13, 1996. President Clinton is visiting U.S. service men and women deployed to Bosnia and Herzegovina, Croatia and Hungary as part of the NATO Implementation Force (IFOR) in Operation Joint Endeavor. In all wars you have distortions and of course no single ethnic group or religious group is immune from slaughtering others during times of war. Yet the wars in the former Yugoslavia were distorted to the point of national shame, and this national shame applies to so-called democratic leaders, like former US President Bill Clinton, and a host of others, who gave their tacit approval for Islamists to have a free-reign in Bosnia. During the conflict we had world leaders who were pleading the cause of radical Islam by showing “a gentle side” to the pluralistic Muslims of Bosnia. However, if you scratch under the surface then you will find out that tens of thousands of radical Islamists were allowed to enter Bosnia in order to slaughter innocent Christians. Before I go further, I will clearly state now that all sides committed terrible atrocities and no ethnic or religious group is “cleaner than white.” In history, all wars will bring out the “dark forces” in humanity which appears to be embedded within the psyche of many people and of course history runs deep within the veins of injustice and revenge or “a just cause” can lead to mass barbarity beyond our deepest thoughts. The story of brutal Christian Serbs was highlighted daily during the Bosnian war. After all, you have to dehumanize a whole people in the West in order to enforce long term objectives and it is vital to manipulate the mass media because they are part and parcel of the propaganda machine. Yet I am going to write about the “hidden hand” of democratic forces that sponsored or gave tacit approval for radical Islamists to slaughter Christians at random. Also, not content with this, the same Bosnian Muslim leadership then gave passports to many radical Islamists after the war. This free-reign meant that innocent Serbian Christians were to meet terrible and disturbing deaths at the hands of radical Islamists who celebrate openly while cutting the heads off innocent civilians. The same Islamic forces which unleashed September 11th and which stone people to death in order to create “year zero,” were welcomed openly by ex-President Clinton and by people within his administration. 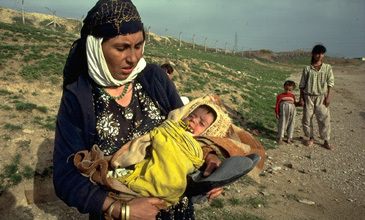 The Republican Policy Committee on January 16, 1997, which can be viewed by clicking onto http://rpc.senate.gov/releases/1997/iran.htm is damning, to say the least. The report also highlights how radical Islamists like Osama Bin Laden were allowed to fund and cause untold misery in Bosnia. Yet during the conflict I recall that the Bosnian Muslim led leadership were meant to be democratic and beyond suspicion. However, the opposite was the case and many senior leaders welcomed Islamic fanatics to their cause because in truth they had their own secret agenda. Therefore, people should open their eyes to the reality of the war in Bosnia and do their own independent research. Also, if the propaganda machine can distort reality so much then what does this say about the mass media in general? Another serious issue is that past policies by many different American administrations have supported radical Islam and its agenda since the late 1970s. Only after September 11th were serious questions raised yet it is abundantly clear that short-term goals have not only destroyed the lives of many innocents, but these short term goals have endangered people to the radical Islamic menace. Without doubt, thousands of Muslims were killed after Srebrenica fell to Serbian forces but the other Srebrenica is not told. This Srebrenica, and the surrounding region, applies to the murder of over 3,800 Christian Serbs who were killed in many barbaric ways. I am not talking about 3,800 military men. On the contrary, I am talking about 3,800 Serbian women, children, and elderly people. Many of these innocent Serbian Christians were killed by sledgehammers, flamethrowers, and other barbaric means. This does not justify anything but you can not judge anything unless the bare facts are given. In truth, tens of thousands of innocents, irrespective if Muslim or Christian, were killed during this brutal war. However, the role of Clinton and others should be told and in an ideal world they should be made accountable for what they did. This most notably applies to what happened in Bosnia but it also applies to helping radical Islam gain a foothold in parts of Europe and how these actions further inspired Islamists to do September 11th and other barbaric actions.